SON OF THE CUCUMBER KING: WHO WAS BASHIR? I would also add that Bashir was the only dream "Lebanese Christians" had...since his death, our community (guess what I am :) ) has been suffering. He was a great man, because he knew what the people needed (not just wanted) and acted for their best interests. And this alone is so rare in politicians (which he really wasn't) all over the world. Bashir was a Lebanese, a true Lebanese, because he saw Lebanon for what it could and should be, the heart and soul of a modern Middle East. Even today, Christian or Moslem is not the division. It is who is working to preserve Lebanon and who is working to destroy it, at the behest of foreign forces. Bashir thought to forge a front with Israel. There was no other way and the U.S. would never stop supporting Israel. It was bold but doomed to failure. Amin was more cautious,became President, and is still alive, but had to endure the sacrifice of his son. Sadly, even today the U.S. does not appreciate the importance of Lebanon and what it has to offer in rebalancing the various factions throughout the Middle East. Hizbollah steals attention away from what is admirable and stable in Lebanese society, and Syria is treated as a big brother to pathetic little Lebanon. Even a movie like "Waltz with Bashir" does not explain the reality created by settling so many refugees in Lebanon, and in such sensitive areas, thereby creating no-man's land areas which were intolerable to a traditional people, whatever their religious sect. When we used to drive to our beach club, past poverty and filth and shanty-towns,we knew time would bring great changes and not for the good. I haven't seen "Waltz With Bashir," but i still want to. Hope all is well, Ray. Now that I can use my eyes again I've just caught up. Your postscript about Bashir was a beautful tribute. It's hard to remember the time when there was hope. Thanks for this. The real tragedy is that Israelis and Lebanese are so similar in mindset and culture, it's ridiculous we're still at war. There's a saying, probably Lebanese in origin - Syria and Iran will fight Israel until the very last Lebanese! Sad, but you know it rings of truth. I am not at all Israeli or Lebanese, but an American educating himself on the strife and culture of the Middle East. There are so many misconceptions and preconceived ideas based on the lack of real communication, and the omnipresence of fear. I am happy that another soldier in the fight for truth has taken a stance to enlighten all of us! 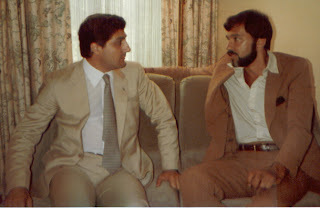 and when I heard about Bashir's assassination, I felt as if I had lost a close friend. When I tried to locate Raymond, to pay respect and to offer comfort - he had disappeared....and still after 40 years, I ask every Lebanese I meet, if they know Raymond Bashir from Bikfaya, but nobody knows.......they remember the family, the place, and then their memories veil their eyes in sadness...their Lebanon is now occupied, stolen, destroyed and violated by the very people they offered hospitality to - who took advantage of their warmth and trust, and stabbed them in the heart....they who are Lebanese, have now become homeless and eternally feel a loss they cannot put into words. But I feel their pain, and all the words that remain unspoken. Bless Lebanon, and yes, Israel has always been a true friend to Lebanon, but, like Lebanon - Israel inspired envy, jealousy and the dark, evil forces who wished to destroy these two wonderful hard working countries,who reached out to extend friendship and hospitality to the same traitors who prefer the handy work of conspiracy and betrayal, murder and destruction - than earning and deserving. And when the thieves and murderers get what they wanted to steal, they will turn on each other, and when their madness, greed and evil has run it's course - and contaminate it with the evil they are, until there is nothing left to steal. Then they will move on, because without the beauty and happiness of the people of Lebanon, Lebanon will remain silent and haunted, and will never give pleasure to those who cannot love it. Bashir will always long for Lebanon, as Lebanon will always long for a son like Bashir, his memory is Lebanon's unfulfilled promise of the future. I pray for Lebanon, with you and for you. Rebecca.